The international sand-sculpture festival Fiesa reopens this week in Pêra, in the Algarve, and for the first time in thirteen years will keep the same theme and the same sculptures as the previous year. The reason for this year’s unchanged appearance is due to the famous festival being in the midst of a relocation process. Forty thousand tonnes of sand have been expertly transformed by some of the best sand artists in the world into imposing sculptures all inspired by the theme music. 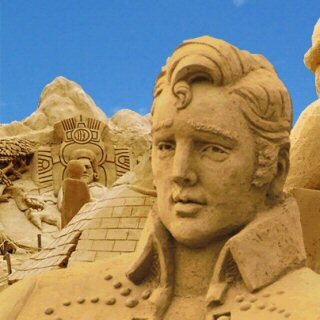 “The Music theme, which is being kept on this year, has created great empathy with the audience who enjoy seeing some of their musical idols reproduced in detail in sand as well as the creative scenes relating to musical expression. A spokesperson for Fiesa – one of the largest sand-sculpture festivals in the world – told The Portugal News that the new location will still be in the Algarve, and that work has been ongoing for some time with regard to its move, but that the exact location of where it will be moving to cannot yet be revealed. Fiesa has been held in Pêra since 2003 and every year attracts thousands of visitors. with stars including Amy Winehouse, BB King, Jimmy Page, Lady Gaga, Frank Zappa and Bono all being represented. A number of sculptures especially for children are also on show with scenes from movies such as Frozen and Mary Poppins. The festival is created by a group of sculptors of various nationalities, who use a range of techniques to sculpt sand and produce original pieces which are remarkable for their size and detail. The show also features a range of activities for visitors to enjoy, including workshops, films, games, competitions, a children’s play area and a food and drink area. Fiesa is open every day from 10am to 7pm until 1 June, to 10pm from 2 June to 14 July, to midnight until 15 September, and closes at 8pm again between 16 September and 15 October.